When Pooja from themumandbabies.com invited me to join the blog train comprising of 41 moms across the globe who will share their stories about how motherhood has changed them, I felt this post will be a cakewalk for me. Afterall, I have been a mom for 27 months now! For the past few days, I have gone back and forth wondering how I have changed or in fact if I have changed at all. I concluded – I haven’t, but I feel I have evolved. I think my journey began even before I had Kenisha – in June 2013 when we got a Moose home. Back then, we were a newly married carefree couple busy with our work over weekdays and recklessly lazing around or exploring places over the weekend. Moose was just 35 days old when he arrived home, but I guess he might have been separated from his mom and siblings much earlier. It sank in rather quick that little guy looked up to me to take care of him from this moment onwards. So began the role of a mother – feed, sleep, clean his litter, repeat. Siddhant and I are dog lovers but Moose became the first dog that we actually got home. Clearly, with no real experience, we were on a roller coaster ride. Sid was busy at work while I managed my business from home. Suddenly I had a lot more to do than I wanted to. Feeding a pup 5 times, clearing up afterward, constant petting and reassuring, running down from 11th floor for potty training after each meal, discipline training sessions, vaccination follow-ups and what not! Motherhood sure kicked in early. But in return, I found a companion for those long hours of work alone at home. I had someone to cuddle with and enjoy long runs and walks every evening. I loved this feeling and it reassured me of my capability to take care of a little human in future. Our family had begun! Then in September 2014, we came across a post in one of the groups calling for volunteers to foster an abandoned female Labrador. We named her Cherry. It took us two months to get her health back on track. And by then we realized how well she got along with Moose.So we finally took a call for adopting her. Now I had 2 babies. June 2015, I was blessed with a baby girl. Life took a 360-degree turn like it does for every mom. Nonetheless, I felt at ease. I knew this. I was expecting this. I was ready. My daughter is my biggest strength today. She has helped me face my biggest demons with a smile, pushed me out of my comfort zone, made me a responsible and a mature woman, helped me prioritize and be less stressed when I mess up, seek joy in the smallest things and above all made me a much happier person! The C-sec scars heal and the post-pregnancy weight also bids farewell. But this precious tiny human helps a woman realize her true potential. I am more patient, more loving. Not just to my own child but towards all children I meet. I respect my mom a million times over and all the other beautiful moms who are doing the best in their ability to raise a beautiful and responsible human. I judge less and I accept more. Motherhood has helped me let go of perfection and accept the fact that I cannot control it all. It has made me real and accepting of my flaws. But it has given me the strength to also stand up to new challenges. Today, I want to be fit and healthy. I want to prove to my daughter that women can do a lot more than what’s set for them traditionally. Even though in the past I have been a marketing professional as well as a businesswoman woman, today if I chose to give it up to enjoy these extra days with her I also got the opportunity to blog and share my experience with all you wonderful moms. So yes motherhood has evolved me into my new Avatar and I absolutely love it! I am part of this blog train started by Pooja Kawatra of Mums & Babies and she has networked to bring together 41 moms across the GLOBE. (Meet the 41 moms here.) Pooja has also shared her own perspective on this here. Next on this blog train is a beautiful mama Misha, mom of twins. Misha freestyle blogger is a fashion postgraduate and has worked as a designer in her initial career years. Post marriage and kids she entered the blogging world with her 2 different blogs. So beautifully written Karuna.there are times when we don’t mind looking the perfect selves, but that surely doesn’t stop us from vouching and aiming for the best for ourselves and our kids. I like your take on this – that motherhood hasn’t changed you per se..rather you have evolved as a person! Very true and I can certainly relate! Motherhood does transform us into a person that we would be suprised of being. It is wonderful journey. I love your sharing and your beautiful photos. I loved how you started your motherhood journey with your fur babies – they truly open up our heart like no one else can. They also redefine the meaning of unconditional love. Karuna, I loved reading your take, how you got moose first and your journey becoming mommy to your girl. Just so beautiful when you this tiny human made you realize your full potential. You are awesome and so is your take! Karuna this is beautiful. I love how your motherhood journey started off with the dogs. People often forget about pets and how they teach us so much. Good on you for appreciating them this way. You are an awesome mama. Very beautifully written Karuna. And you are a best mama , your motherhood journey is totally different from others. Nice to read your lovely motherhood journey. You have such a cute family. Complete with so much love from Moose, Cherry and now Kenisha. Such a fulfilling motherhood journey. What a lovely family of 5 you have here! It must be such a joy to watch them growing up and growing up with them. Having a pet is a lot of hard work!!! Kudos to you for adopting ur 2nd “baby”… And great job on taking care of 3 “babies”. I have seen you with all 3 kids of yours & how you sometimes you have to miss on a few things being a pet mommy. But that never lets you down & your smile is always intact. More power to you. Loved reading your journey from being a pet mommy to a pet as well as a human mommy. Loved reading about your wonderful journey Karuna. And the love that you have for your fur babies has been expressed so beautifully. Your daughter is indeed really blessed to have such a wonderful family.More power to you. Beautiful clicks, Karuna. Glad to know that you are a dog lover. Your words have done the highest justification in expressing your heart as a mom. Well expressed take on the motherhood. Happy to join with you on this blog train. Absolutely karuna. Motherhood evolves us into a new Avatar. 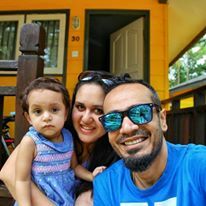 Happy to see how you are enjoying with days with daughter and yes blogging is always fun and exciting. I feel kids gives our life a new dimension. Loved reading it and the fact that cherry and moose happened before Kenishka must have made you an experienced mum .. I have taken care of two of the pets at my moms and I know it’s nothing less . Such a honest and personal post! Cherry, Moose and Baby K are lucky to have you by their side.